Disclaimer : The views and opinions expressed in this article are solely those of its writer’s and contributors. Stories may be enhanced for dramatic effect. Sunday. The final round of the final major. A leaderboard full of golf’s greatest names. Day, Spieth, Cole, Quinn, McIlroy, Yeager, and McCreary just to name a few. 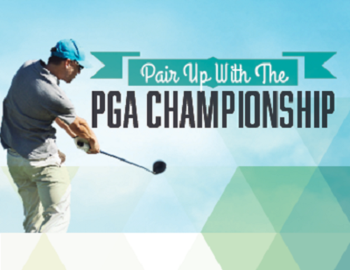 Before the round we already knew it was going to be special, but there was nothing – and I mean nothing – that could have prepared us for what was about to happen that day at the Pair up with the PGA Championship at Ed Oliver GC. Players started to arrive early. J. Koukoulis testing out new gear, LTC Dave hitting range ball after range ball with Army taught discipline, Breezy icing down the coolers. But it wasn’t them who the fans were here for. The World’s Number One scramble team was on the way. K. Johnson was first to arrive – bagel and coffee in hand. Clark and Jones were not far behind still wiping the powdered donut sugar from their mouths. Finally the one they call Big Dawg, with his flaky croissant and a banana-nut muffin, made his way to the registration table to complete what was known by many as “The Dream Team”. For them, today was just a mere formality. But would this lackadaisical approach backfire? Would the time spent picking up their assorted baked goods have been better spent on the practice green? Raff and Shields sure thought so. Only time would tell. The time had come to hit the tee. This four-person scramble format with a modified Stableford scoring system was now officially underway. It was the Dream Team that struck first with a birdie on hole one, matched by team Snyder, Yeager, and Koukou. Team Medicare (Quinn, Raff, Les, and Breezy) would get on the board on hole 2. An eerie silence fell over the scoreboard on hole’s 3 and 4, with only 3 points picked up by the entire field. And then it got good. Team Allen got into the mix with a couple of 2 point birdies, C. Mumma and team Yeager ham-and-egged for another 4 points. Team Koukou picked up 6 thanks to some strong play by Long Drive runner-up T. Shields and the par 3 accuracy of D. McCreary. But it was the Dream Team and Team Medicare going blow for blow making a combined 6 birdies on the last 4 holes to close out the front nine. The next four holes sent a message. With birdies on 10, 11, 12, and 13 Team Medicare had picked up another 8 points to take a 4 point lead with 5 holes to play. Raff, Les, and Breezy hit shot after shot, with TQ making every putt he saw. When asked about his unbelievable putting, TQ was quick to credit club professional Dennis Taggart. “Dennis has really helped me with my game”, TQ said. “He is clearly the best club professional in the BCG Wilmington family”. In a dead heat with 18 points each, The Dream Team and Team Medicare began the walk from the 17th green to the 18th tee. Les could be heard getting his team mentally prepared for what could possibly be the biggest moment of their long golf careers. The opposite was true for the Dream Team. The fear of being de-throned in front of thousands, if not dozens of spectators, was too much. There was dissention in the ranks when Jones asked to tee off first. Big Dawg and Clark argued over playing safe to the fairway, or trying the long-ball over the chimney. “I AM CAPTAIN NOW!” shouted Johnson. You could cut the tension with a knife. Tee shots were in the air, and as expected Team Medicare was right down the middle, albeit a good 50 yards behind the Dream Team. Not a problem for Les, who is spending his last days at the white tees, as he put his 4 hybrid to within 15 feet. The putt was made for a 2 point birdie for an 18-hole score of +20. The Dream Team sent their approach shots towards the elevated 18th green. Johnson to 18 feet, Dawg to 20, Clark to 13, and Jones to 15. Self-proclaimed Captain Johnson selects Jones as the anchor man for the 13-footer to tie. After 3 good looks and near misses, Jones lines up his ball. A bit uphill and a right-to-left break. Sweat – either from the blistering sun or the sugar from his morning donut- dripping from his brow. The stroke. A perfect end-over-end ball rotation. It’s right on line, hits the right edge of the cup and……lips out. Shock and silence on one side. Jubilation on the other. Team Medicare has a 2 point lead in the clubhouse. Now it’s just comes down to the Pros. Each team was given a choice of a PGA professional who’s score would also apply to the total team score. The Dream Team chose Rory McIlroy who finished with 7 points making their combined total +25. Team Medicare chose Justin Rose whose double-bogey minus 3 on 13 had this match at tie once again, but just for a moment as his birdie on 16 would put them back up by 2. Playing safe, Rose lags his first putt on 18 to two-feet, taps in his minus-1 bogey Team Medicare cards a +26. It’s over. “I didn’t hear no bell!”, shouted Talley from the corner. He and Team Yeager, despite coming into the clubhouse a full 7 points back had Jason Day and his 12 points. They now were also +25 and only 1 point back as Jason Day marched up to his 60 foot birdie attempt on the 18th Green. Alas, the would-be history making putt fell just inches short, as did the hopes of Team Yeager. Day, after letting his team down, immediately began to sob as he tapped in his par putt. When asked about his tears, Day responded, “To come this close to my first Pair Up with the PGA Championship victory, and to see it fall just inches short….it…it just hurts so bad”. The match was over. Not since Y.E. Yang defeated Tiger Woods at the 2009 PGA Championship has there been an upset like this. Team Medicare had made history. And the Dream Team, like Jason Day, will remain on the list of the best players never to win the Pair Up with the PGA Championship at Ed Oliver GC.